“The idea of getting back to basics and cooking real food with and for children is the most important thing parents can do for their family’s health. Stacy Toth and Matthew McCarry’s family was suffering, from asthma, obesity, eczema, pet and seasonal allergies, depression, joint pain, and even severe attention disorders. After years on medication, they made a simple dietary change by eliminating gluten and processed foods and saw their family heal and become the pictures of perfect health, both physically and socially. Their journey inspired them to create their website (PaleoParents.com) in order to help other families identify and overcome health disorders through an ancestral approach to diet and lifestyle. They now know that gluten, a protein found in wheat, barley, and rye, was a main culprit in their family’s ill health. Gluten can cause an array of health problems. It is the main culprit for Celiac Disease, which is increasingly diagnosed along with many other food allergies and intolerances. Allergens in general are on the rise for today’s families. More and more children are diagnosed with the “top eight” food allergies, and anything containing these allergens are placed on families’ “no” list. Parents are left trying to make their kids feel “normal” in a world where they can’t eat what other kids are eating. 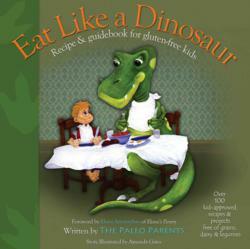 Eat Like a Dinosaur aims to give children with food allergies inspiration to be excited about the foods they can eat. With the top eight allergens visually marked on each page, kids can pick which healthy recipes they want for lunch or a school snack. Old classics like waffles, chicken nuggets, cupcakes, and ice cream are now grain-, dairy-, soy-, peanut-, and refined sugar-free. Parents no longer need to buy boxed foods to give their children pride in the food they eat. “Eating homemade, unprocessed foods is fun when you get to eat like a dinosaur!” said Toth. “Don’t be fooled by the ever increasing volume of overly processed gluten-free goodies on your grocery store shelf,” McCarry says. “The idea of getting back to basics and cooking real food with and for children is the most important thing parents can do for their family’s health. It might be overwhelming to think about where to begin, but Eat Like a Dinosaur will help families make this positive shift." Eat Like a Dinosaur offers more than a 100 kid-tested tasty recipes that will steer children toward meats, vegetables, fruits, nuts, and healthy fats. But with numerous chapters dedicated to family projects, like visiting you-pick farms, it establishes a way of incorporating real food and family values into a lifestyle. Stacy Toth is a working mother who brings home the bacon and Matthew McCarry is the culinary genius and stay-at-home-dad that cooks it up. Inspired by the luminaries of the Paleolithic lifestyle (bestselling authors Robb Wolf and Dr. Loren Cordain), they cleaned out their pantry and lost over 200 pounds together in a little over one year. Now active and playful, with enough energy to climb trees, play chase, and lift multiple children above their heads, they’re enjoying every moment they have as a family. Matt and Stacy find that being able to offer their children an opportunity to grow-up healthy and strong, the way nature intended, is the most powerful thing about eating real food.